As someone who’s played each western Etrian Odyssey release, I consider myself a big fan of the series. As such, I played through Etrian Odyssey Nexus half lost in a daze of nostalgia for the familiar labyrinths and enemies from previous games and half waiting to see what new elements the game would add to the series. Adhering to the phrase “If it ain’t broke, don’t fix it”, Nexus takes the tried-and-true Etrian Odyssey formula and does well with virtually all of its components: music, battles, interactions, and world-building. Etrian Odyssey Nexus immediately lets players know that it takes place in the same world as the other releases in the series in the opening scene and doesn’t let go of the nostalgia factor all the way through. Setting off for the Lost Islands of Lemuria, a land previously cut off from the rest of the Etrian Odyssey world, players are deposited in the airship city of Maginia. 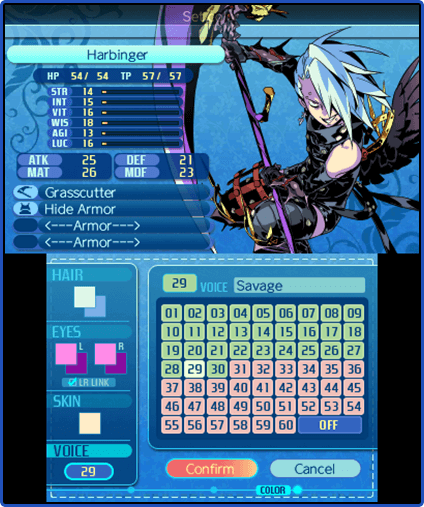 As in other Etrian Odyssey games, the menu-based home city consists of an inn for sleeping and saving one’s game, a shop for purchasing and upgrading equipment, a bar for accepting side quests, a guild hall for building the party, and a local government office where the main narrative is doled out. The first task in Nexus is to create an adventure guild and fill it with up to one hundred player-created members. Eighteen returning classes from previous games and a brand new Hero class give an almost overwhelming variety of party build choices, given that players can only take five party members with them at a time. Although it happens arguably too late in the game, characters eventually gain access to a second class’s skill tree, effectively doubling the skills they have access to. Once ready to begin the game proper, players will encounter NPCs from Etrian Odyssey III’s Armoroad shortly before taking on enemies from Etrian Odyssey I in a dungeon ripped straight out of Etrian Odyssey IV. However, those not familiar with prior entries won’t be negatively affected from a gameplay standpoint, as the first labyrinth is a brand new creation that slowly explains all the necessary game mechanics to those that need it. All classes have eight character portrait options and eye/skin/hair color options aplenty. Aside from the town interactions and a world map with clickable icons of locations players are able to visit, the bulk of time in Nexus is spent in labyrinths, and players will spend a great deal more time there in this series finale. 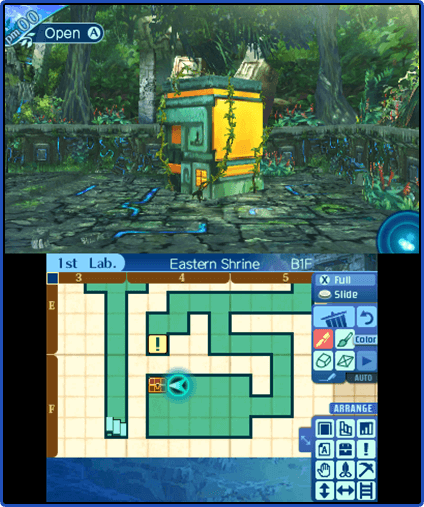 While most previous Etrian Odyssey titles consist of five individual labyrinths of five floors each, Nexus breaks the mold with more than a dozen unique multi-floored labyrinths and many more smaller ones to explore, with three times as much post-game content than has been offered in the series before. Navigation is purely a first-person dungeon-crawling affair, with beautifully-designed labyrinths on the top screen and a bottom screen that allows players to map out their path. The game offers dozens of options for players to color, annotate, or drop handy icons onto the map using the stylus. The 3D effects provide an amazing depth of vision as players wander around colorful, unique labyrinths, each easily distinguishable from the others. The amount of attention given to the backgrounds matches the amazing character and monster designs, making Nexus a visual treat for players. This is nothing new for the series, but something added in this installment worth mentioning is the ability to climb up on walls while navigating certain labyrinths. This seemingly small addition allows for a slew of new navigational puzzles based upon this mechanic, many that wonderfully incorporate the difficult visible enemies known as FOEs present throughout each labyrinth. Battles in Nexus are mostly random encounters with the exception of the aforementioned FOEs and boss fights. A danger icon in the corner of the top screen slowly builds as players move, indicating the current likelihood of a random encounter. This is a great mechanic that lets players know approximately how long they have to explore before needing to be ready for battle again. Battles in Nexus see five characters lined up in two rows to take on up to two rows of enemies. In addition to physical attacks, defending, or using an item, characters can use technical points (TP) to cast spells or use skills. This basic system is virtually unchanged from the original Etrian Odyssey, but it is as polished a traditional turn-based RPG battle system as can been found in modern games. The half-dozen or so status effects that party members and monsters can inflict upon each other, coupled with a trio of bindings that can nullify specific arm, leg, or head-based skills, spells, or attacks, are not mechanics to simply ignore in Etrian Odyssey Nexus. What seem like commonplace RPG ailments are major obstacles to breezing through even random encounters due to the severity of many of them and the vast variety of healing spells or items needed to remove them. Positioning characters is also vitally important due to restrictions on weapons and skills based upon which row players are in and the ability for some attacks and spells to splash damage to enemies adjacent to the target or pierce lines to damage foes behind the target, mechanics enemies can also exploit. All of this coupled with buffs, debuffs, elemental resistances, weapon-type resistances, and more require players to enjoyably put more thought into every battle and rarely, if ever, engage the auto combat option. Treasure chests have a slightly different appearance in each labyrinth, one that blends well with the graphical feel of the surrounding area. Series music composer Yuzo Koshiro has done another wonderful job on the soundtrack for Nexus. The music beautifully complements the easy pace of life in town, the sense of wonder while exploring, and the sense of excitement and danger during battles. However, while the previous three 3DS Etrian Odyssey releases have had English voice acting, Nexus only offers Japanese. It does have the option to turn off the Japanese voices completely, but this also removes helpful hints characters often blurt out while walking through the labyrinth and during battles. Not giving English audio hints about secret passageways or enemies’ elemental weaknesses is a highly disappointing omission for the pinnacle of the Etrian Odyssey series. The Japanese voice acting also has significant annoyances, such as the horrible, cringe-worthy laugh by the tavern owner at the beginning and end of each side quest that was the final straw in the decision mute voices for a large chunk of the playthrough. There’s virtually no overarching narrative during the first few labyrinths in Nexus, but this begins to change as players progress further into the game. Races from previous Etrian titles emerge as major players in the journey to the Yggdrasil Tree at the center of Lemuria. Various NPCs join the party from time to time, providing helpful bonuses during labyrinth navigation such as restoring TP or randomly finding rare items. A main antagonist arises eventually and puts the fate of the races encountered, and seemingly the entire world, at risk. While not terribly original, it does have some small plot twists and turns. Compared to other titles in the series, the plot is more pronounced in Nexus, without being its main focus. There are a few features from its more recent predecessors that Nexus sadly misses out on. The two Etrian Odyssey Untold titles both incorporated items called grimoire stones that could bestow additional skills upon characters, while Etrian Odyssey V and Untold 2 both featured cooking systems that could boost stats for a time or provide extra healing in dungeons. Neither of these appear in Etrian Odyssey Nexus and the game feels a bit emptier for it. Despite these disappointments that only series’ veterans would even notice, Etrian Odyssey Nexus proved to be a fun game and a solid ending to the DS/3DS entries. It punched hard numerous times throughout its sixty-plus-hour runtime, and had me fondly remembering my nearly blind, decade-old experience with the original Etrian Odyssey many times. While it provided numerous callbacks to multiple past entries, Nexus continues to push the design forward. Atlus did a fine job of designing a game accessible for newcomers with plenty to offer series veterans, or anyone looking for a strong RPG challenge.